Pittsburgh Local 38061 bargains and enforces the contract for newsroom reporters, photographers, copy editors and artists at the Pittsburgh Post-Gazette. Our newest unit comprises full-time professors at Point Park University, who voted overwhelmingly in June 2004 to join the Pittsburgh Guild, making us the first Guild local to represent faculty at a major university. Our office suite is on the second floor of the Regus Building next door to the Post-Gazette on the North Shore in Pittsburgh. Four times a year, we hold general membership meetings. We don’t have an office staff, but you can contact us by phone at 412-770-3147, email at pghguild.com or by mail at 322 North Shore Drive, 2nd floor, Suite 250 Pittsburgh, PA 15212. You can also follow us on Facebook and Twitter. 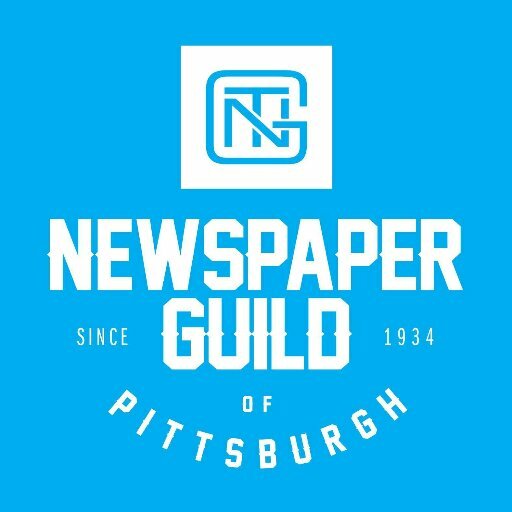 The Newspaper Guild of Pittsburgh was chartered in April 1934. At that time, we were members of The American Newspaper Guild, which changed to The Newspaper Guild in the early 1970s with the addition of members from Canada and Puerto Rico. It is now called the NewsGuild. In July 1997, The Newspaper Guild became a sector of the Communications Workers of America, which has more than 650,000 members in the telecommunications industry. The Pittsburgh Guild is in CWA District 13 and the TNG Great Lakes District. The TNG/CWA sector has more than 30,000 members in the advertising, business, circulation, editorial, maintenance, promotion and related departments of the newspaper industry. Membership dues rates are established by TNG/CWA. Initiation is $10 and monthly dues are 1.5 percent of one week’s salary. Dues are deducted weekly by the payroll department. On months with five weeks, no dues are deducted that week. We remit approximately $20 per full-time member and about $8 per part-time member to TNG/CWA each month. The balance of the dues revenue is deposited into our treasury. The Newspaper Guild of Pittsburgh/Communications Workers of America, Local 38061, shall be governed by the Constitution of The Newspaper Guild/Communications Workers of America, its policies adopted in international Convention and the following by-laws, which are supplementary thereto. 1. The membership of the local shall be the supreme authority of the local except when the membership shall act by referendum. 2. Between general meetings of the local, its governing body shall be the Executive Committee, which shall administer its affairs, but it shall make no decision permanently establishing the general policies of the local. 3. Shop units shall exercise only those functions and powers specifically granted by the TNG/CWA Constitution and these by-laws. 1. Regular meetings of the membership shall be held, at least, quarterly, the specific time and place to be set by the Executive Committee. The annual meeting shall be held in September or October of each year, on a date set by the Executive Committee. The committee shall notify the membership at least two weeks in advance of the date of the annual meeting. 2. The secretary shall give no less than five (5) days’ notice to the membership in advance of every meeting; except that in an emergency the Executive Committee may call a special meeting on two day’s notice. 3. Notices for special meetings shall state the purpose of such a meeting. 4. No motion to reverse or review previous decisions of the membership or the Executive Committee shall be acted upon unless it shall have been contained in the notice of the meeting. The secretary shall include in the meeting notice any motion from ten (10) or more members of an intention to move for such a review. 5. A special membership meeting shall be called by the secretary on instructions of the Executive Committee, or on a written petition signed by not fewer than twenty (20) percent of the membership in good standing at the time of the filing of the petition, or a request from one unit, properly voted at a quorum meeting of the unit. 6. A quorum for any meeting shall consist of ten (10) members in good standing. 1. The Executive Committee shall consist of the elected local officers, the Chairman of each unit and three delegates elected by each unit. 2. The Executive Committee shall meet each month subject to change at the discretion of the Committee. 3. Special meetings shall be called by the president or secretary. 4. A quorum at any meeting of the Executive Committee shall consist of not less than half the normal membership of the Executive Committee. 5. The Executive Committee shall supervise the handling of all funds except for payments of strictly routine nature. Checks shall be valid only when signed by the treasurer and either the secretary or president. 6. The Executive Committee may at anytime appoint committees to perform certain duties and delegate specific authority to such committees. Such committees shall at all times be subject to control, removal or replacement by the Executive Committee. 7. Notice of all action taken by the Executive Committee shall be transmitted to the General Membership. 8. The Executive Committee shall have general direction of all local officers. 1. The president shall preside at all membership meetings and meetings of the Executive Committee. The president shall coordinate the duties of other officers and all members. The president shall be a member of all committees. 2. The secretary shall be the custodian of the local’s records, other than financial, shall conduct routine correspondence of the local and such other correspondence as may be directed by the Executive Committee or the membership and shall keep accurate records of the minutes of all meetings. 3. The treasurer shall be the custodian of all funds of the local under the direction of the Executive Committee, except that no authorization shall be required for routine expenses and routine transmission of International funds to TNG/CWA. The treasurer shall report on the local’s finances at all regular meetings of the local and whenever called upon by the Executive Committee or the local membership and shall present his accounts for audit at any time the Executive Committee or the local membership desires. The treasurer shall keep complete and accurate records of the membership, their addresses and dues standings. The treasurer shall be responsible for the application in the local of the financial provisions of the TNG/CWA Constitution and these by-laws, acting through unit treasurers in the case of members of the units, and shall issue to unit treasurers routine supplies required for their work. The treasurer shall be bonded in a sum to be set annually by the Executive Committee. 4. The first vice president shall perform the duties of the president in the absence of that officer and shall be a member of the Executive Committee and shall perform other duties outlined by the membership. 5. The second vice president shall perform the duties of the first vice president in the absence of that officer. The second vice president shall be a member of the Executive Committee and shall perform any other duties outlined by the membership. 6. The third vice president shall perform the duties of the second vice president in the absence of that officer. The third vice president shall be a member of the Executive Committee and shall perform any other duties outlined by the membership. 1. The officers of the local shall be elected annually by secret ballot through a referendum by the membership on a date set by the Executive Committee, such date being not less than three (3) weeks after the date of the annual membership meeting, but not later than Oct. 31. Except that at a regular meeting of the Guild membership, next preceding by not less than thirty (30) days the annual election, the membership, by referendum may set the terms of all officers at two (2) years. 2. The Executive Committee and Unit Chairman shall appoint election committees for each unit of the Local. The election committees will operate as such from one annual meeting up to the next annual meeting when new committees shall be appointed. Committee members may be reappointed. None of the election committee members shall be candidates, contested or uncontested, in that election, nor should they be active in the campaign of any candidate. Any contact between the two units regarding the conduct of the election should be restricted to the committee members until the election is validated. 3. Candidates for Local office shall be nominated, with proper seconds from the floor, during the annual membership meeting. Additional nominations may be made in writing to the Election Committee during the seven (7) days following the annual meeting. Within ten (10) days after the annual meeting the Election Committee shall communicate to the membership the list of qualified candidates. Nominated candidates must accept or reject their nominations in writing no fewer than ten (10) days before the election. 4. In the event at a time of the annual election where there is only one candidate for any one post, the name of the nominee shall be left off the ballot and the nominee shall be declared elected without vote. In the event there is more than one candidate, a majority of those voting shall be required to elect. 5. All terms shall begin November 1. Terms expire Oct. 31 the following year except as provided in Article V, Section 1. 6. Delegates to whatever councils the local may be affiliated with or in the future may affiliate with shall be appointed by the Executive Committee at the first meeting in January of each year. 7. The selection of delegates and alternates for the TNG-CWA Sector Conference and CWA Convention shall take place no later than the [calendar] quarter preceding the quarter in which the earlier of the two meetings is scheduled. Delegates and alternates to the TNG-CWA Sector Conference and CWA Convention shall be nominated from the floor and elected by secret ballot at a regular membership meeting. The membership shall also determine the number to be elected. In the event the number of candidates exceeds the number of delegates and alternates to be elected, the meeting may defer the election and make provisions for a special election by secret ballot after not less than fifteen (15) days written notice to the membership. Candidates and/or alternatives shall be selected by number of votes received but in no event shall the number selected exceed the number agreed upon that the local Executive Committee feels should attend for the best representation and the good of the local. Delegates shall have the necessary expenses to the convention paid by the local. 8. No member shall hold dual office in the Guild. Members elected as local officers cannot be elected as Unit officers in the same year. 9. Absentee ballots must be requested within seven (7) days after the annual meeting. Absentee ballots must be received by the Election Committee no later than one day preceding the election. 10. In the event of a tie in the balloting, the Election Committee shall schedule and conduct a run-off election within thirty (30) days. 1. Except for the office of president, vacancies in the post of Local officers shall be filled by vote of the Executive Committee. Officers so named shall hold office only until the next regular membership meeting of the Local. Proper notice of such meeting and election shall be given five (5) days before the meeting. A vacancy in the office of president shall be filled by the first vice president until a referendum election is held in accordance with these bylaws. Nominations shall be made at the next regular membership meeting of the local. 2. Candidates for vacancies for Local or Unit offices shall be nominated, with proper seconds, from the floor during the meeting. Additional nominations may be made in writing to the secretary during the seven (7) days following the meeting. Within ten (10) days after the meeting, the secretary shall communicate to the membership the list of qualified candidates. Nominees wishing to withdraw shall do so in writing at least three (3) days before the date of the election. 3. In the event there is only one candidate for any one post, the name of the nominee for that post shall be left off the ballot and the nominee shall be declared elected without vote. If there is more than one candidate, a majority of those voting shall be required to elect. 4. Officers elected to fill vacancies will serve the remainder of the term. 1. Unit procedure for electing unit officers (chairman, vice chairman, secretary, treasurer and delegates to the Executive Committee) shall follow the procedure outlined in Article V.
2. Unit nominations and elections shall follow the procedure outlined in Article V, Sections 2, 3, and 4. 3. The unit treasurer, under the direction of the local treasurer, shall have charge of the execution of the fiscal provisions of the TNG Constitution and these by-laws as they apply to unit members. 4. Vacancies in posts of unit officers or delegates to the Executive Committee shall be filled under the procedures outlines in Article VI. 5. Unit election deputies shall be declared by the Executive Committee. 6. Unit secretaries shall file promptly after every unit meeting a copy of the minutes of the meeting with the local secretary. 1. An applicant for membership shall submit his application to the Executive Committee and final action upon any application shall be by the Executive Committee, subject to appeal as provided for in the TNG Constitution. 2. Good standing requirements of the TNG Constitution in respect to dues shall apply equally to initiation fee payments under Article XI of these by-laws. 3. Reinstatement fees shall be set by the local Executive Committee. 1. Negotiators in collective bargaining on behalf of the local or any of its units shall be selected by the Executive Committee. The negotiations shall be open to members of the Guild. 2. Any agreement arrived at in negotiations shall be submitted to the membership of the unit or unites for approval. Before signing, it shall require ratification also by the local’s Executive Committee and the contracts committee of TNG. 3. During any period when collective bargaining involving a unit is pending, no member of a unit shall discuss collective bargaining with the employer, or representatives of the employer without other members of the committee being present. 4. No officer of the Local or Unit is authorized to reach any agreement on matters pertaining to conditions, covered by unit contractors, without approval of the Executive Committee. 1. Discipline under these by-laws shall be governed by the TNG Constitution under Article XII thereof. 2. The local shall have a standing Trial Board, consisting of five members including the President and appointed by the President with the advice and consent of the Executive Committee, and subject to approval by the membership. The Trial Board will operate under procedures outlined in the CWA Constitution. 1. Dues shall be paid monthly and graduated in accordance with the wages of members as per minimum dues schedules established in Article XVIII, Section 2(c) of the TNG/CWA Constitution. Dues for unemployed members shall be ten (10) cents per month with a minimum payment for twelve (12) months. Dues for associate members shall be three dollars ($3) per year. 2. Each applicant admitted to membership shall pay an initiation fee of ten ($10) dollars. 3. The local may, by vote of a membership meeting, levy an assessment of not more than one dollar ($1) per member per week. Notice of the proposed assessment shall be contained in the notice of the meeting at which it is proposed such action be taken. 4. All money collected on behalf of or in the name of the Local, except those collected for the TNG/CWA, or another branch of the TNG/CWA, shall be the property of the local. 1. Any matter to be decided by the Local may be submitted to a referendum of the membership by either the Local or the Executive Committee and shall be submitted to such a referendum upon a petition signed by not less than ten (10) percent of the membership in good standing at the time of the filing of the petition. 2. Provisions for conducting a referendum shall be made by the Executive Committee, and may take the form of a vote by mail or a vote in person at designated polling places or a combination of both. No ballot shall be mailed to a member not in good standing at the time of the mailing of the ballots, and all members shall be given fifteen (15) days’ notice in advance of any referendum by mail. 1. These by-laws may be amended by any membership meeting upon submission of the proposed amendment by the Executive Committee on its own motion or by petition signed by not less than twenty (20) percent of the membership in good standing. Such proposed amendments shall be distributed to the membership in no less than ten (10) days prior to the meeting called to consider such amendments, along with notice of the time and place of the meeting. 2. These by-laws shall be considered adopted after they have been submitted to the membership for approval or disapproval, and a majority of those balloting have favored their adoption. 1. In no instance, where a member is elected to a local office and later on elected to a unit office which automatically puts him on the Executive Committee of the local, shall these by-laws operate to further increase the number of Executive Committee members not operate to give an Executive Committee member more than one (1) vote. 2. These by-laws shall be interpreted by the Executive Committee, thence to the membership, to the TNG/CWA Executive Council and the next TNG Sector Conference. Questions of procedure not covered by the TNG/CWA Constitution, Convention decisions, or these by-laws shall be governed by Roberts Rules of Order.